Ultherapy™ vs Thermage™ for skin lifting? 1) require little to zero downtime from daily activities. 2) are more affordable/budget friendly. It is for these reasons that Botox™, Lasers, Radio Frequency, IPL and Micro-Focussed Ultrasound therapies are popular solutions for anti-aging. Ms. Ward goes on to say that selecting the right treatment for lifting requires due diligence, as not all devices are created equally. “Thermage™ opened up the playing field for the treatment of lines and wrinkles, only. However the exclusion of “lifting” along with cost of treatments, discomfort and need for multiple sessions now makes Thermage™ less popular. Skin that is strong, firm and has good elasticity is a common goal for those aged 35 and beyond. It is the job of aesthetic practitioners to explain that healthy looking skin is built on a strong foundation, deep within the tissue. 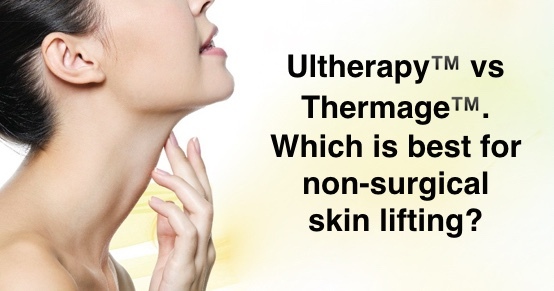 Ultherapy™ has the ability to work deep in these precise layers, making it the modality of choice. “The precise nature in how Ultherapy™ energy is deposited, allows most patients to see visible transformations, in only one treatment. Ultherapy™ heats the tissue at 3 depths (1.5, 3.0 and 4.5 mm), targeting deeper than any other facial aesthetic technology. Treating at the 4.5 mm contracts the SMAS (this is where a surgeon will treat during a face lift) which results in lifting of skin. Peer-reviewed clinical studies demonstrate that a collagen contraction occurs due to high temperatures reached below skin, while leaving the outermost layers of the skin unaffected. Heat contraction that occurs is 3-dimensional for immediate tightening, as well as the production of new collagen. Because outermost layers are fully protected, there is no downtime. The best outcomes rely on the ability of a device to deliver energy while enabling the operator the ability to actually visualize (Diagnostic Ultrasound) that the energy is reaching optimal depths. Both FDA & Health Canada approved, Ultherapy™ is considered an industry leader for its ability to satisfy both conditions. Ideal for treating the full face, neck, brow, eye area and chest, with improvements that always look natural and are noticeable. ULTHERA™ only device APPROVED FOR LIFTING skin allows for improved collagen density and offsets the effects of aging .